Livin' in the Blurbs: Make Those Plans! There's one day a year when eating chicken wings isn't appropriate: February 11th, Gallus Domesticus Solidarity Day. But there are 364 days a year when chicken wings are yummy and fun to eat! Tim likes his wings hot, spicy, and dunked in good blue cheese dressing. His recipe uses Sriracha chili sauce to drive up the heat and Rogue Creamery Oregonzola to cool it down. Throw in a few stalks of celery for snap and it's a party in your mouth. You'll want to have big napkins on hand—Tim's Spicy Wings can be messy (like so many good things in life!). Either preheat oven to 400 degrees or start the charcoals on the barbecue. Toss the wings, olive oil, salt and pepper together until wings are coated. If using the oven, line a couple of baking sheets with foil and spread the wings out in a single layer. Bake for 50 minutes, or until wings are golden. If using the barbecue, spread them evenly over the grill and cook, turning at least once, until cooked through and golden. Just before wings are done, melt the butter and stir together with Sriracha in a large bowl. Add the Tabasco sauce if you want to kick the heat up even more. 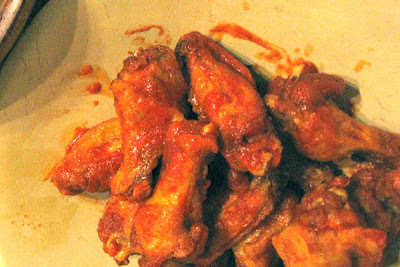 When the wings are done, put them into the bowl and toss well to coat. To make the dressing, put the ingredients together in a bowl and mix well to a fairly smooth paste. * You can find Sriracha sauce in grocery stores that carry Thai ingredients. It comes in a plastic bottle with a rooster on the label, and is a terrific condiment to have on hand. Photo from The Village Voice.